Are you ready for the ultimate driving challenge? This is more than a driving experience. It’s the chance for experienced track drivers and club racers to enter the world of international motorsport and test a thoroughbred Le Mans prototype racer, with a full works team. This is your invitation to join the upper echelons of the sportscar racing world with our exclusive Le Mans Test Pilot Program. Join our official works team at Sonoma Raceway, Buttonwillow Raceway Park, or Thunderhill Raceway Park for a full day’s testing, or sign up for our intensive two or three-day courses that will push your limits as a driver and provide the ultimate challenge. You can even name your circuit and we can make all the arrangements as part of our bespoke package. 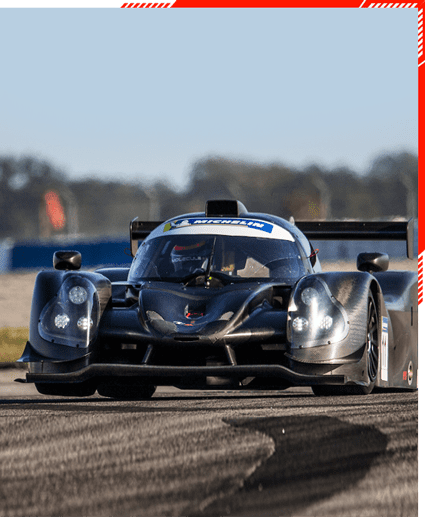 You will take the wheel of the iconic Ligier LMP3 car that household names have taken into battle in the legendary Le Mans 24 Hours and Rolex Daytona 24 Hour races. It’s a state-of-the-art sportscar with a full carbon chassis, advanced downforce and a 420bhp, 5-liter V8 engine shrink wrapped inside that lightweight skin. This is not just another car. It is not just another racing car. This is the elite. This purpose-built international racing car is one of the most technically advanced racing machines in North America and the top speed of 173mph simply doesn’t do the car justice. 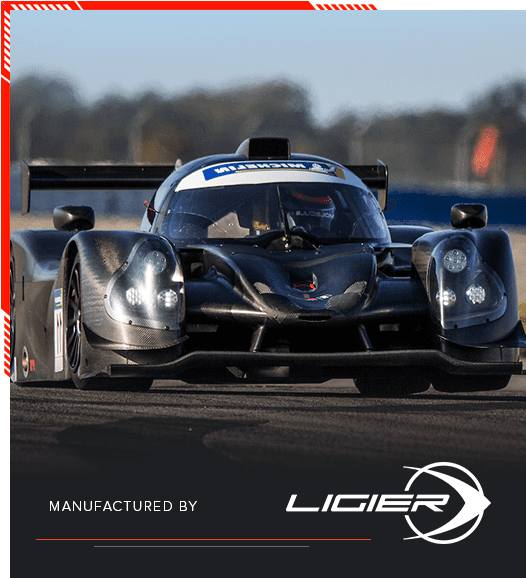 With just 2050lb of curbweight hugging the track on racing tires and race suspension, the Ligier LMP 3 will put your skills to the test as you learn to extract the absolute maximum from a racing icon. You will also learn how to set the car up to suit your driving style. You will take the wheel of the iconic Ligier LMP 3 car that household names have taken into battle in the legendary Le Mans 24 Hours and Rolex Daytona 24 Hour races. It’s a state-of-the-art sportscar with a full carbon chassis, advanced downforce and a 420bhp, 5-liter V8 engine shrink wrapped inside that lightweight skin. Your pit crew includes a former F1 crew chief and an army of active professional racing mechanics and engineers. An experienced international LMP3 racing driver will help you get the most from the car and work on any specific technical issues with the car or your driving style. They will lead you through the arsenal of telemetry and teach you the fineries of setting up a car over the course of a session. Three way adjustable suspension, anti rollbars and the wings all have to work in harmony to get the absolute most from the car. We have practised masters that can show you tips and tricks that the world’s best teams spent millions of dollars to learn the hard way. They bring decades of experience in professional motorsport, they have worked with World Champions and they will make you a more complete driver. Your pit crew includes a former F1 crew chief and an army of active professional racing mechanics and engineers. 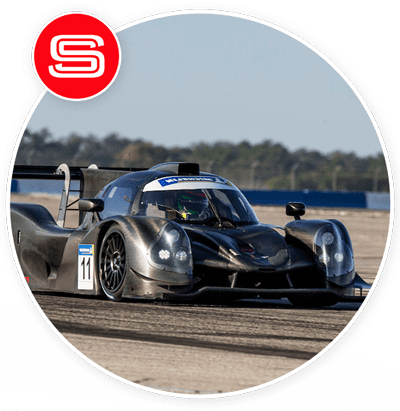 An experienced international LMP 3 racing driver will help you get the most from the car and work on any specific technical issues with the car or your driving style. But when the engineers have cleared the garage, the engine fires into life, the car vibrates menacingly and you get the green light, it’s all on you as the driver to carry the hopes of the team. This is your moment. This is the time to stitch together everything you have worked on as a group, everything you have learned, to go for your personal best flying lap. This is the moment you will simple never forget. That deep-throated V8 rises to a roar, the thumping sequential paddleshift gearbox transforms into a savage as you push the drivetrain to the limit and you’ll feel the downforce pushing the car ever harder into the bend as you find just that little bit more speed. You’ll be at one with the car and you’ll find a new limit within yourself. Even if you’re an old hand on track then the cornering speed of this car can be a shock to the system in the first session. We’ll break down every corner, every apex, entry point and braking zone. We’ll tune your technique, we’ll make you smoother, faster and you will tame the dragon. The car is pure sensory overload. It’s also one of the safest cars we have ever seen. We don’t take chances with your well-being and this car is built to notoriously strict international sporting regulations in terms of crash protection. No road car comes close and we feel safer knowing that you are safer. We have 100 test days to choose from and a number of different packages to suit your budget and ambition. Sign up for a one day taster course with one of the world’s most advanced racing cars, or immerse yourself in racing technology and pure speed for three days on our flagship intensive test program that gives you more than 250 miles on track. This is not a driver experience, it’s something new. It’s the golden ticket behind the scenes of international motorsport. It’s a chance to live the dream and become a professional racing driver. Are you ready for this once in a lifetime adventure? Then sign your test contract with the works Ligier LMP 3 team and join our Le Mans Test Pilots Program now!